When going through my papers found I had brought some of your things home with me – Senator Kennedy’s letter, etc. Sorry about that. Have been very busy since returning. The following weekend we went over to Champaign. John had an Indonesian dinner for us on Saturday evening. Lea helped him prepare it. On Sunday we had dinner at Lea’s. We attended the Wesley (on campus) service on that Sunday morning and heard Rev. Richard Hamilton from Bloomington, Indiana, preach. In this month’s Together Magazine there was quite a bit about (in our Indiana section) about the Fund for Reconciliation and how the two Conferences are going about the job of raising the funds. Rev. Hamilton is in charge of the South Indiana Conference fundraising and Rev. Bjork is in charge of the North. Last Monday a week ago I had to go to Plymouth to attend a meeting of the Division of Christian Outreach. Have another meeting next week with the Section of which I am Chairman – Social Witness – to get what we have to say ready to go into Conference Minutes. 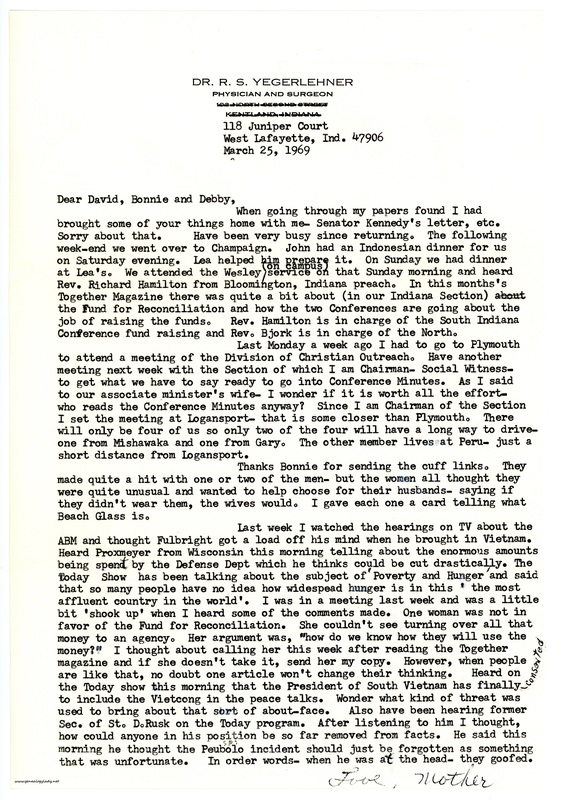 As I said to our associate minister’s wife – I wonder if it is worth all the effort – I set the meeting at Logansport – that is some closer than Plymouth. There will only be four of us so only two of the four will have a long way to drive – one from Mishawaka and one from Gary. The other member lives at Peru – just a short distance from Logansport. Thanks Bonnie for sending the cuff links. They made quite a hit with one or two of the men – but the women all thought they were quite unusual and wanted to help choose for their husbands – saying if they didn’t wear them, the wives would. I gave each one a card telling what Beach Glass is. Last week I watched the hearings on TV about the ABM and thought Fulbright got a load off his mind when he brought in Vietnam. Heard Proxmeyer from Wisconsin this morning telling about the enormous amounts being spent by the Defense Dept. which he thinks could be cut drastically. The Today Show has been talking about the subject of “Poverty and Hunger” and said that so many people have no idea how widespread hunger is in this “the most affluent country in the world.” I was in a meeting last week and was a little bit “shook up” when I heard some of the comments made. One woman was not in favor of the Fund for Reconciliation. She couldn’t see turning over all that money to an agency. Her argument was, “How do we know how they will use the money?” I thought about calling her this week after reading the Together Magazine and if she doesn’t take it, send her my copy. However, when people are like that, no doubt one article won’t change their thinking. Heard on the Today show this morning that the President of South Vietnam has finally consented to include the Vietcong in the peace talks. Wonder what kind of threat was used to bring about that sort of about-face. Also have been hearing former Sec. of St. D. Rusk on the Today program. After listening to him I thought, how could anyone in his position be so far removed from facts. He said this morning he thought the Peubolo (sp.) incident should just be forgotten as something that was unfortunate. In other words – when he was at the head – they goofed. 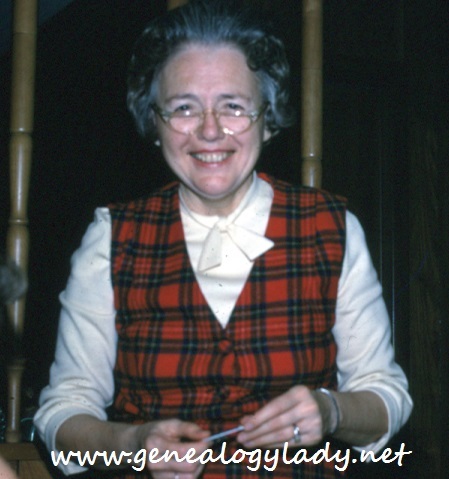 This entry was posted in Genealogy, Yegerlehner and tagged 1960s, genealogy, Gladys R. (Foster) Yegerlehner, Indiana, John F. Yegerlehner, Lafayette, Lena "Lea" (Keith) Gieselman, Methodist Church, Roscoe S. Yegerlehner on May 28, 2017 by Deborah Sweeney. “Last week I watched the hearings on TV about the ABM and thought Fulbright got a load off his mind when he brought in Vietnam. Heard Proxmeyer from Wisconsin this morning telling about the enormous amounts being spent by the Defense Dept. which he thinks could be cut drastically.” How well I remember those two brilliant, articulate advocates for sanity in the midst of the Vietnam madness. “After listening to him I thought, how could anyone in his position be so far removed from facts.” Some things never change!